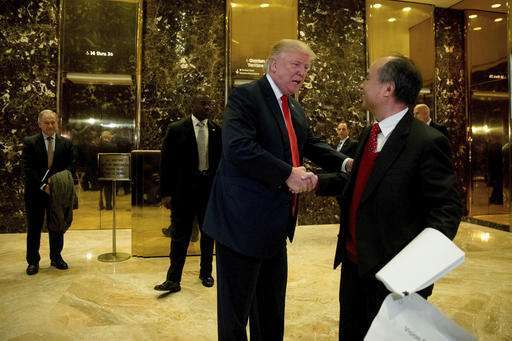 Japanese billionaire Masayoshi Son, who met with President-elect Donald Trump and then announced plans to create 50,000 jobs and invest $50 billion in U.S. startups, has been one of Japan's most aggressive overseas investors for over two decades. He's getting an early start on deal-making with the future president. A graduate of the University of California at Berkeley, Son founded Softbank in 1981 after selling a pocket translator he invented while still in college to Sharp Corp. for $1 million. Softbank became Japan's largest distributor of computer software and leading publisher of computer-related magazines and books, going public in 1994. The Tokyo-based company is now one of Japan's biggest telecoms providers, with more than 63,590 employees, a solar power business, humanoid robots for home use, ride-booking services and financial technology. It recently set up a $25 billion private fund for technology investments, along with Saudi Arabia and other investors, that Son says could grow to $100 billion. But Softbank has had its ups and downs over the years, occasionally having to retrench and sell off investments. ARM HOLDINGS: In July, Softbank bought Britain's ARM Holdings for 24.3 billion pounds ($32 billion), in a deal the British government hailed as a vote of confidence despite its decision to leave the European Union. ARM is known as an innovator in smartphone technologies and the "internet of things." ''Now is the time. This is the Cambrian explosion," Son recently told investors in a presentation. SPRINT CORP.: Son's 2013 purchase of a 70 percent stake in Sprint Nextel for $20 billion was the biggest foreign acquisition in the history of Japan Inc. The U.S. wireless carrier is slowly turning itself around, though it reported a loss of $142 million in its fiscal second quarter. 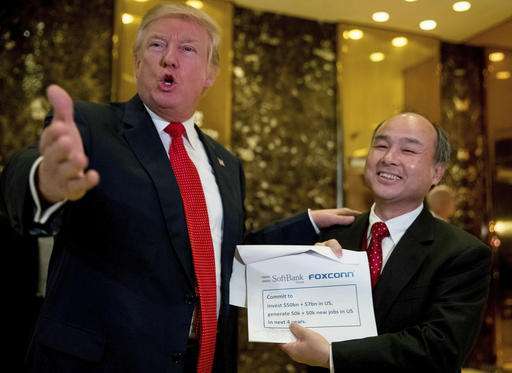 Son hopes to expand Softbank's U.S. footprint by acquiring T-Mobile. On Tuesday, he praised Trump as a "deregulator," suggesting he is hoping the new administration might ease hurdles to such a deal. Son has said he believes the mobile Internet is the most important, backbone technology for the 21st century, but the U.S. lags in terms of speed. He could be looking to focus investments in that area. ALIBABA: Son says he parted "unwillingly" with some of his investment in the Chinese e-commerce giant to help pay for the ARM acquisition. "But I still believe in Alibaba's future; it is still in the process of growth and it has a big future," he said in an earnings presentation last month. SUPERCELL: Earlier this year, Softbank sold its stake in Finnish game developer Supercell to Chinese technology firm Tencent in a deal that values the company at about $10.2 billion. INDIA: Son has pledged to invest $10 billion in India over 10 years, though Softbank has had to write off losses from ride hailing technology company Ola Cabs and e-commerce company Snapdeal. EARLIER DEALS: In 1995, back when Softbank was still a software distributor and publisher of computer and hi-tech magazines, it bought Comdex and other computer-related show businesses from The Interface Group. Eventually it sold off the trade shows. Over the years, Son has also invested in satellite TV and other media ventures, in banking and in Japan's Nasdaq. An investment in U.S. computer memory board maker Kingston Technology Corp., in 1996, is considered one of Son's missteps.